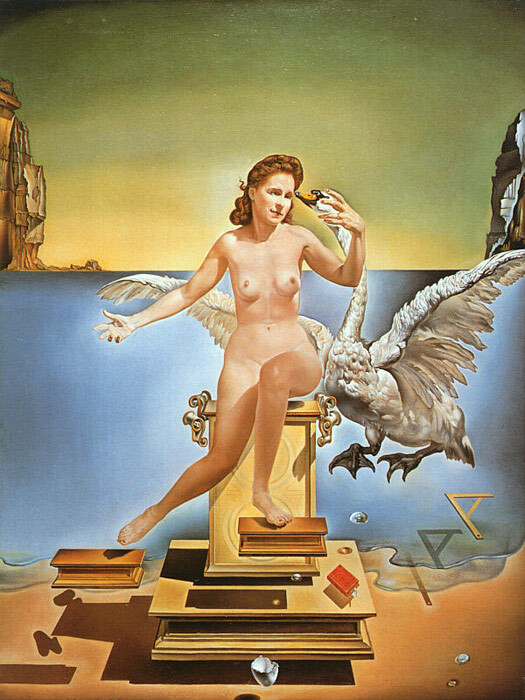 Leda Atomica is a painting by Salvador Dali who was the top Surrealists of this time. Surrealism explored the subconscious, the dream world, and irrational elements of the psyche in the firm belief that the discoveries to be made from such exploration would be of greater fundamental importance to the human condition than any other form of social analysis. Surrealists like Salvador Dali was very fascinated by the ephemeral state of the mind between sleep and consciousness, dream and reality, sanity and insanity, as one in which the mind functioned purely, unfettered by the constraints of logic and social behavior . Leda Atomica is Dali's way if interpreting the Annunciation, Leda plays a mortal woman visited by a metamorphosis god in order that she might bear his child, acts thereafter as a conduit through which her son's mortal counterparts may regain access to the god that gave them birth. " A figure of intercession, an agent of mediation between rational man and state beyond the rational, she is both child-women and women-with-child" , because she is a virgin, based on the Christian- Catholic divinity belief. Gala in a sense is a god's muse, and is close to those incarnations of the surrealist muse "Gala is being the supreme example" according to Dali, who owe their pictorial and literary identity to ht e activity of their men. The muse is the object of "desire, of love, and God is, famously, love itself" according to Dali's philosophy). Dali's transformation of Mary is the result of love as if he created his love to Gala, like God to Mary. SPECIAL NOTE : The painter will make the reproduction as close to the original oil painting as possible. If you want your painting to alter from this likeness, please email us and " Leda Atomica , 1949 " will be reproduced according to your special requirements.